Gansu Hongfeng Machinery Co.,Ltd.,at the foot of the Kongtong Mountain and along the Jinghe River,is located at Pingliang city,an important city (of Shanxi Province,Gansu Provine and Ningxia Province) on the Ancient Silk Road.Thecompany is a high-tech company reorganized by the former State-run 920 Factiry,with an area of 305 mu (50 acres),which is well known for manufacturing base of special trap and energy-saving device with pretty good scientific research capability,advanced equipment,perfect testing and inspecting means and modern management system.With the total assets of $19.39 million, the company has two wholly-owned subsidiaries and 192 technicians. The former State-run 920 Factory (State-run Hongfeng Machinery Factory),founded in 1965,belongs to the former Ministry of Arms Industry as a large enterprise of secondary class. and Ceerificate granted by the CCS. 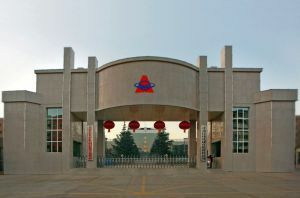 It established Technological Center,Engineering Center,Experiment Center and R&D Center that approved by provincial government.The company was granted as efficient and engergy-saving steam trap demonstration base by the former State Economic and Trade Commission (SETC),accepted as a member of factory of the Materials and Resources Market by the SINOPEC,CNPC,CNOOC and China Power,and awarded the high-tech enterprise by Gansu Province Sci-tech Department. During years of development ,the company has always regarded energy conservation,pollution reduction and environmental protection as the cornerstone of business strategy.With the faith of serving the country ,in pursuit of excellence corporate core values ,the company actively participated in international & domestic energy conservation and environmental protection,devoted to developing circular economy and improving energy conservation and pollution reduction,and made great contribution to the energy managment energy saving , pollution reduction and environmental purification.